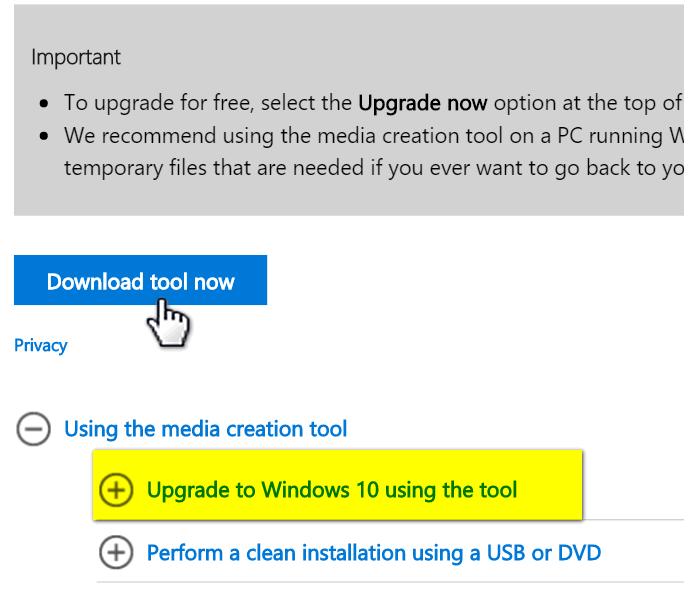 If you want to create an installation USB or DVD or download the Windows 10 ISO from which you can create an installation DVD, you’ll see this (see below) just below the “Upgrade now” section. Under the gray “Important” section, you’ll see a button that says “Download tool now” . This is the Windows 10 Media Creation Tool. Beneath that, you’ll see instructions on how to use the tool to upgrade to Windows 10 or to perform a clean install. We don’t recommend a clean install unless you’re a fairly advanced user and are familiar with clean installs of Windows. What if you did not reserve a copy — or don’t want to wait? For those of you who didn’t reserve a copy or for those of you who did reserve a copy but don’t want to wait – you can download the Windows 10 download tool which lets you upgrade your PC directly or create in installation USB or an ISO file from which you can create an installation DVD. If you choose create a USB or DVD – you will need a blank 4GB (or larger) USB flash drive or blank writable DVD. If you choose “Upgrade This PC now” the Windows 10 upgrade will start downloading in the background – you can keep using your computer normally while the Windows 10 upgrade downloads. It’s a big download (over 3GB) so, depending on your connection, it may take a while. Above: Upgrade your PC to Windows 10. 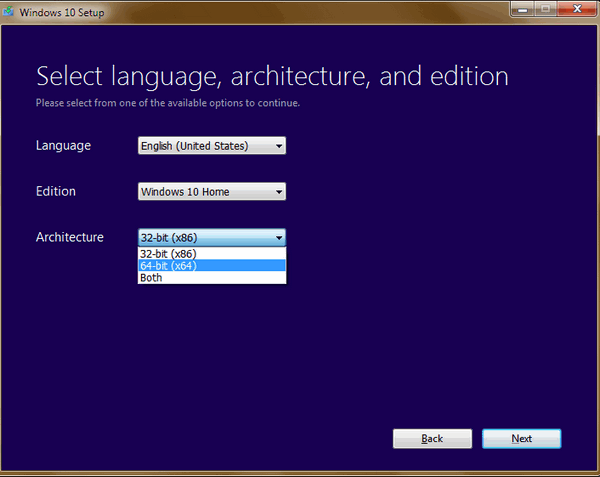 Below: Create installation media – choose your language, the edition of Windows (Home, Pro, etc.) and 32-bit, 64-bit or both. Keep in mind if you’re using Windows 7 Home Premium or Windows 8.1 Home you must choose Windows 10 Home. If you’re using the Pro version of Windows 7 or Windows 8.1, choose the Pro version of Windows 10 – and so forth. If you’re not sure what version your using, press and hold down the Windows Key and tap the “Pause/Break” key. Above choose the architecture. Keep in mind, if you’re running 32-bit Windows now you should choose 32-bit or “Both”. Conversely if you’re running 64-bit Windows, choose 64-bit or “Both”. 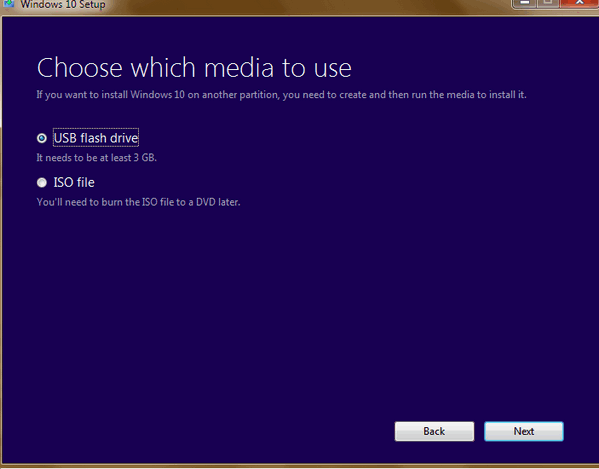 Above: Choose whether you want to create an installation USB or DVD. If you’re using a computer older than 4 years, to be on the safe side, choose the ISO option to create a DVD. Many computers made 4 years or more ago don’t have the option to boot from a USB unless you change your BIOS settings, which most of you are not going to want to do. If your computer is 3 years-old or newer you should have no problem booting from the installation USB. Microsoft has made upgrading to Windows 10 easier than any previous upgrade and from what we’ve seen in our own testing and the reports coming in from others today – it appears the upgrade is very easy and flawless for most people. However, there’s never a guarantee when it comes to computers – your experience may be different. If you’re using Windows 7, keep in mind it is supported until January 18, 2020. While Windows 10 has many great features and is a great operating system, if you’re happy with Windows 7 and your computer is a newer Windows 7 computer , you’re under no obligation to upgrade – you’ll get extended support from Microsoft until 2020. So upgrading really is your choice. If you’re using Windows 8.1 we think you’d benefit from upgrading to Windows 10…Windows 10 is what Windows 8 wanted to be when it grew up. Thank you for this info on a do-it-yourself installation. But you may not want to go to that trouble after you read below about my experience. I thought I’d post my experience of upgrading to Windows 10 today for those who fear the worst. I was able to upgrade to Windows 10 last night (early today, 7/29/2015) to replace Windows 7 Home Premium. I was in the Tech Preview program so probably the upgrade earlier than many will. It went very smoothly. Everything I had in Windows 7 seems to be in place and working. I was delighted. I’ve heard horror stories about in-place upgrades in the past and was tentative about trying it but figured I had a backup if needed, so decided to go for it. I’d prepared an image backup in case things didn’t go well and I needed to restore Windows 7 and start over, doing a totally new install using an .iso image instead. The process took 1.5 hours for my machine and my collection of programs. Windows 10 seems really quick and responsive and all my programs are available and usable. I’m enjoying using it and tweaking it. I hope your experience is as good as mine. Just a week or so before leaving Windows 7 I learned a tip that makes it easy to dock two windows side by side. Press Windows Key+Left Arrow to dock one window to the left and Windows Key+Right Arrow to dock yone window to the right. That works in Windows 10 too. But you can also drag a window to the side to do that in Windows 10. Enjoy Windows 10. Later this morning (7/29/2015) I got a query on my machine asking me for feedback on how the upgrade went. I gave it a 5 out of 5. I was delighted that it went so well and so easily. Good job, Microsoft. Thanks Charles. We recommend that everyone use the regular update if they have reserved a copy – if they haven’t then we recommend using the download tool and ticking “Upgrade this PC” – this results in the exact same installation choices as the users who reserved a copy. If users have more than one computer making an installation USB or DVD may be faster and more convenient. Another reason we can see for creating an installation DVD or USB is that it’s nice to have it – somewhere down the road it may be useful. 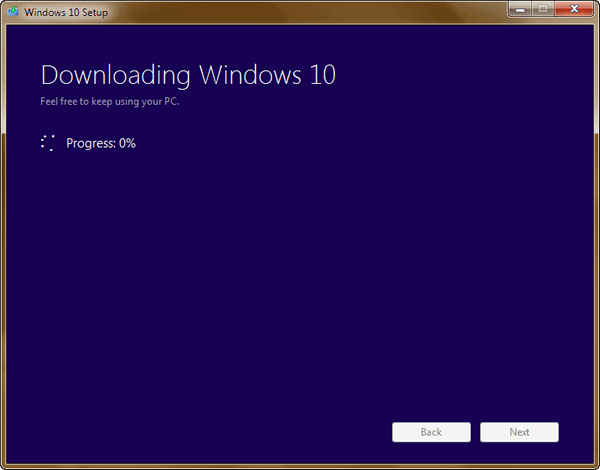 Before downloading the ISO file, I thought I’d see if this new Windows 8.1 PC was Home or Pro. Nothing I could find would indicate which I have… Windows key + Pause only indicated that I had Windows 8.1 and nothing specific about which version of Windows 8.1 I have. So, any idea how to figure out which version of Windows 8.1 I have? Home or Pro? If your computer properties says Windows 8.1 you are using Windows 8.1 Home. If you’re using any other version it will specify the version – for instance Windows 8.1 Pro. 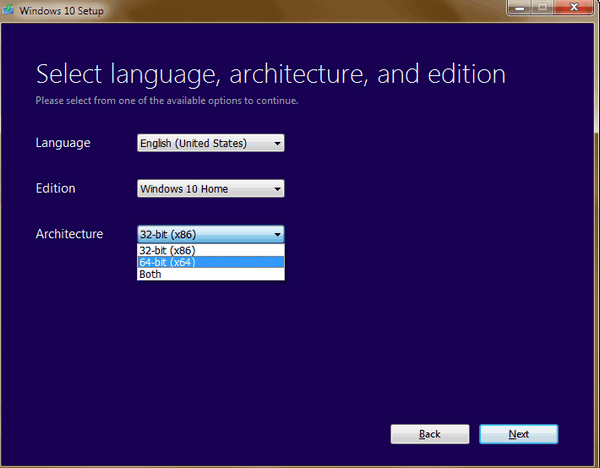 Windows 7 specifies Home Premium, Pro, etc. That was so refreshing to hear that you had no problem’s with the install! I will do mine in the morning! How do I know whether to download the 32-bit or 64-bit version of W10? I seem to have both on my computer, as I see some things marked 32 bit and others 64 bit. How does one tell which version is the one to download? This is an important question, because I don’t want to spend hours downloading the wrong version. All answers are much appreciated! Press & hold down the Windows Key + the Pause/Break key to open System Properties. This works on all versions of Windows. I have Emsisoft Anti-Malware (paid version) and I was just curious. Infoave (this is to you also), did you uninstall your antivirus before you put Windows 10 on , or did you let Microsoft do it like they said they would and reinstall it. What is your opinion on that. I have not been hearing anything one way or the other about that, and that surprised me with them removing the anti-virus and putting it back. I have Classic Shell on my Windows 8.1. I guess it should be uninstalled before Windows 10. I don’t think Windows 10 would uninstall it on it’s own, or would it? I would like to try out the new Windows 10 start menu. You can install Emsisoft now and then upgrade to Windows 10 or you can wait. Emsisoft is fully compatible with Windows 10. We’ve upgraded 2 computers so far and both had Emsisoft – and we didn’t have any problems at all. You can uninstall Classic Shell when you start the install of Windows 10. The install consists of downloading the files – so you have a lot of time you can use your computer during the download phase of the upgrade. Uninstall Classic Shell then or you can wait until you install Windows 10. One thing for sure, Windows 10 start menu offers a lot of features that Classic Shell does not. But let’s be thankful for Classic Shell – it made Windows 8 a lot more tolerable. Would like to know, before downloading Windows 10, if it is still possible that TC or EB check my computer to get rid of anything that should be removed before downloading Windows 10. I have a Direct Computer Care with special number that I have not used yet. Thanks. I have an Win 8.1 laptop w / 6 GB memory & 320 GB HD. I reserved a copy of Win 10. If I download Win10 & all goes right could I then make an image / clone backup in case of HD / component failure ? I only have Emsisoft , reg org & classis shell currently installed as the laptop was only purchased to try Win 8.1. I went on my computer today and Windows had tried to update my computer to Windows 10 which failed so I tried again and it failed. Now I got no notice that it was ready nothing from the Windows 10 little box in my toolbar. Did this happened to anyone else? 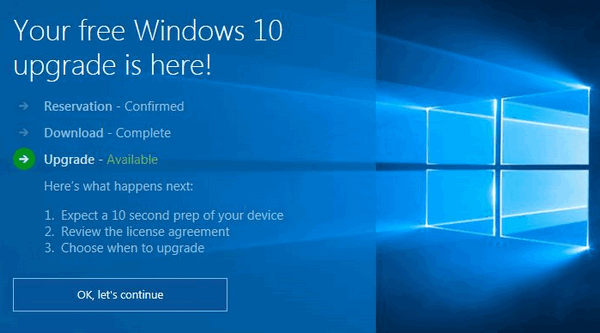 Windows 10 will not install automatically – you need to be present and actively initiate the upgrade. Microsoft is notifying some users that they upgrade has been delayed and will be available in a few days or week. If you don’t want to wait read the article above. Can I install Windows 10 on a cleaned hard drive with the iso file. I own the licence to Windows 8 Pro? 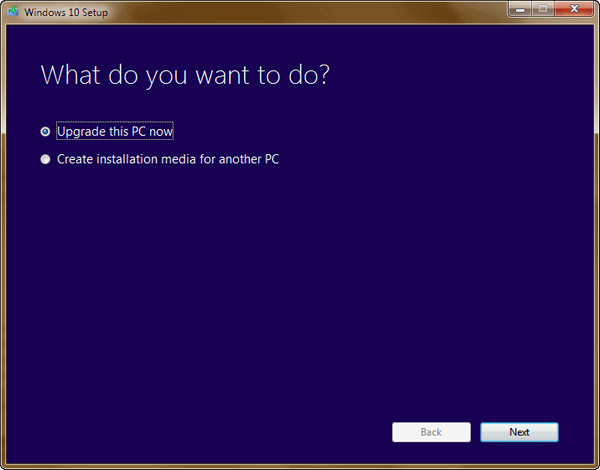 Will the installation program ask for my Win 8 licence number to confirm my ownership? Yes and yes it will ask you for your license …however… I strongly recommend that you install Windows 8.1 pro on the clean drive and immediately upgrading to Windows 10 using the download tool – without creating ISO file. You would need to create the ISO file using the download tool, then create an installation DVD. It’s essentially the same as a clean install since you haven’t have use Windows 8.1 at all and immediately upgrading to Windows 10 would virtually be a clean install. Just curious before installing Windows 10~~I have heard that Windows 10 does not have Windows Live Mail. Is this true? If it doesn’t have Windows Live Mail, what type of e-mail program does it have and will I have to set up my e-mail addresses all over again? Windows 7 had no mail program at all, Windows 8 had a terrible “Mail app”, and Windows 10 has a slightly less terrible Mail app – still not worth a hoot. Windows Live Mail can be downloaded and installed on Windows 7, 8, or 10. Of all the computer brands in all the world the last brand we’d ever recommend is HP. You did the right thing by taking the HP back. We’ve used Dell for years and are very happy with them. We just got a new ASUS and it’s a beauty. Both Darcy and I have not a lot of love for HP printers or computers. I have a product ID for Win 8.1 but I don’t have a license key. I bought the computer with Win 8 os. 8.1 was installed in the store. Am I going to be able to download Win 10? I have tried unsuccessfully to install Windows 10 (I have Windows 7 64bit at present). I always get the error with the blue screen “0x1900101-20017. The installation failed in SAFE_OS phase with an error during boot operation”. Looking up this error on Google it would appear that hundreds are having this problem. Apparently Microsoft have not published a solution to this problem. There are literally hundreds of error messages. Most are cause by incompatible hardware or something installed on your system or some other requirement that is not compatible with Windows 10. This does not necessarily mean there’s a flaw in Windows 10. According to the latest info we have there are over 50 million people who have successfully installed Windows 10 – so a few thousand having problems is very small percentage of the total. I do empathize with you though – it’s not a small percentage if one of them is you. When we do prechecks for Windows we check drivers, hard drive errors, hard drive space, Windows system files, RAM, etc. to make sure a a computer has a better than average chance of installing Windows 10 without any problems. But there is no surefire system for guaranteeing anything – Microsoft sure doesn’t guarantee anything.